A little over a year ago I was at Best Buy and two guys were playing a demo of a game in which a ship is flying over some terrain and it would jump every once in a while to avoid obstacles. I know. Not much of a description. They didn't know the name of the game and I had to leave so I couldn't stick around to find out. The game stuck with me. The visuals were interesting and the gameplay looked like a lot of fun. So, I scoured the internet until my friends on this website were able to identify it. The name of the game is Race the Sun. I found out that the game would not be released on the PS4 for a few months, but I was eagerly awaiting it. However, it wasn't until recently that I finally played the game, and on the Wii U, no less. Before I get into the game, I would like to the explain why I was so enamored with it with just a passing glance. In 2009, a little game called WipEout HD was released for the PS3. WipEout (1995), developed by Studio Liverpool is Sony's answer to F-Zero, though, interestingly enough, the polygonal racer preceded Nintendo's first polygonal version of F-Zero (F-Zero X on the N64) by 3 years, so it seems that both franchises inspired each other at certain points. In WipEout HD, there is a racing mode called 'Zone.' 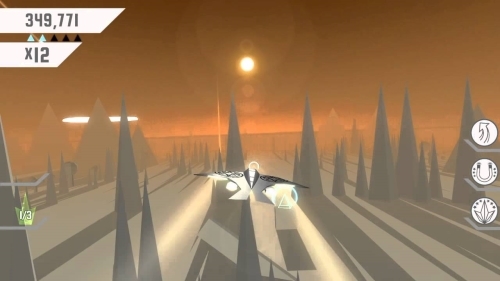 In this mode, players control a Zone ship, rather than one of the normal vehicles. The ship can only accelerate, not decelerate, and it continues to accelerate while lapping the track until it is destroyed. Zone is the first "speed runner" racer I had ever experienced, and I was hooked. Not only was the gameplay addictive, the visuals were also stunning and radically different from the rest of the game. 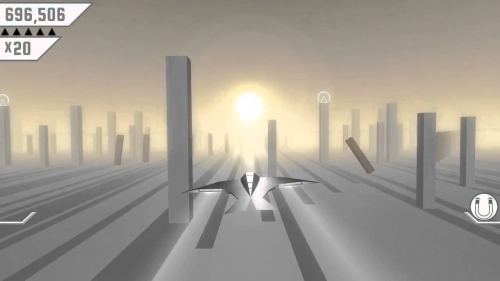 The graphics in normal WipEout tracks were usually very detailed, colorful, futuristic, and realistic. The graphics in Zone mode, however, were stylized versions of these same tracks, focusing on a few colors, smoothing out the graphics, and adding a sort of cel shading effect. Ever since playing this mode, I've wanted a game solely dedicated to it. Race the Sun is that game. In Race the Sun, you control a little solar powered ship in an endless runner game, that seems to be heavily influenced by Zone Mode in WipEout. You are literally racing the sun since you must continue to run towards it as daylight fades. If the daylight fades, your engine stalls and you lose...then you blow up. As the sun is setting, it kind of gets in your way, so it becomes a bit hard to see what's coming straight at you sometimes. If you run under shadows, these will slow down your ship since you're not getting any sunlight for your solar powered ship. You lose the game whenever you hit an obstacle, such as walls, mountains, ships, etc. When you lose the game, you have to start from the beginning. Each run is separated into regions. While you are racing, you can also collect blue glowing pyramids (Tris) that give you points and increase your multiplier, yellow boosters boost your speed and reverse time (extend daylight). 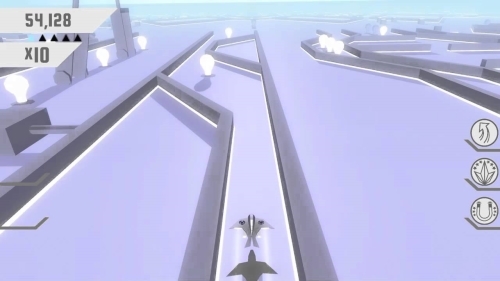 At the end of each level, a white bird flies down and drops Tris for you to collect. He also drops powerups such as jumps, boosts, or shields. Every once in a while, you will find a portal which will take you to an asteroid field filled with Tris, girders, and, well, asteroids. 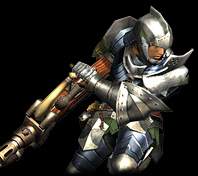 The game also has RPG elements. While you are playing, you can complete objectives such as collecting a certain number of Tris, or reaching a certain score. You will be able to tackle three objectives at a time. These objectives award from one to three points depending on their difficulty. Every 5 points, you gain a level. These levels grant you rewards that you can use on later playthroughs. Some examples of these rewards are the ability the hold more jumps and longer battery life. You are even awarded decals which you can then place on your ship's wings. There are many rewards, some of them are pickups (such as jumps), some of them are for immediate use (such as boosts), and some of them are configurables (such as decals). But I'll stop right here so as not to spoil them. The game has a very interesting features that immensely adds to its replayability. The game resets every 24 hours. What does this mean? Every day, the regions will have entirely different layouts and the leaderboards will also reset. This is fantastic because it means that every day, you will be able to play a new game. There are two other modes in the game besides Race the Sun mode. Apocalypse mode is like the main game but in super hard mode, right from the start. The sky will be tinted orange as if you were piloting your ship under an apocalyptic landscape and the game will throw everything at you, all the time, with no mercy. It's fun but you will not last long unless you practice, A LOT! This mode is insanely hard! In Labyrinth mode, you navigate your ship from a far off, overhead perspective. You must traverse various obstacles and puzzles (at a much slower pace) in order to finish each region. You can collect light bulbs to increase your points and multiplier. This mode has an actual end to it. I have yet to finish it, but I will continue my efforts later. Not my favorite mode but, it's a nice change of pace. The game looks cool. The graphics in the game are simple but elegant; minimalistic yet stylized, just like in Zone Mode. The game looks like a cross between WipEout HD's 'Zone Mode' and Star Fox. You can see the Star Fox influence with all of the angular shapes and even the arches (which Miyamoto loves). You can also play the game using the D-pad but, I highly recommend using your TV instead. The music and sound are pretty standard fare. It's nothing extraordinary but completely inoffensive. You will not find yourself humming along to the tunes or having the music stuck in your head, but you will not find it grating at any moment, either. The sound design simply serves to give the game a bit more atmosphere, but it doesn't really stand out in any way. I do have to say, though, that I encountered some audio glitches here and there. When the big squares are tumbling down, sometimes you can hear a scratching sound, and, extremely rarely, you will lose the music completely. This happened to me once after recovering from almost losing sunlight in one region. The lack of music for the rest of that run made it difficult to ascertain when I was in danger losing all sunlight. But, like I said, this is extremely rare. It only happened to me once in my many hours of playtime. Race the Sun is a very well crafted, extremely entertaining game. It has something very few games these days have. That "one more game' factor. I can't tell you how many times I picked up the game to play for just a few minutes and ended up playing for two hours or more. The objectives contribute greatly to this factor. Once you clear an objective, you'll see the next one and you'll think, "I could do that on the next run." Two hours later, you forgot to make dinner and now you have to go out and buy something cause it's too late to cook. This may or may not be a true story. Today, I was ranked 8th in the world in Race the Sun. No biggie. All in all, I highly recommend Race the Sun, unless you have responsibilities and stuff. In that case, run away, fast! This game will hook you and never let you go! Do you ever feel sorry for videogame characters? Or other gaming quirks? Club Nintendo 2012 Rewards begin to ship!!! Article by the heads of Flippfly, the studio behind Race the Sun. Great read! @Zero I have that article saved so I can read it later. Any plans for releasing this game on the 3DS?